Everett High School awaiting their trophy after their 31-7 victory over St. John's Prep. Foxborough, MA – Ask me what exactly my favorite afternoon has been in the month of December of 2010 and my answer, Saturday December 4, but why this particular day? There really hasn’t been too many days in the brand new month, so what exactly makes this particular date so darn special? 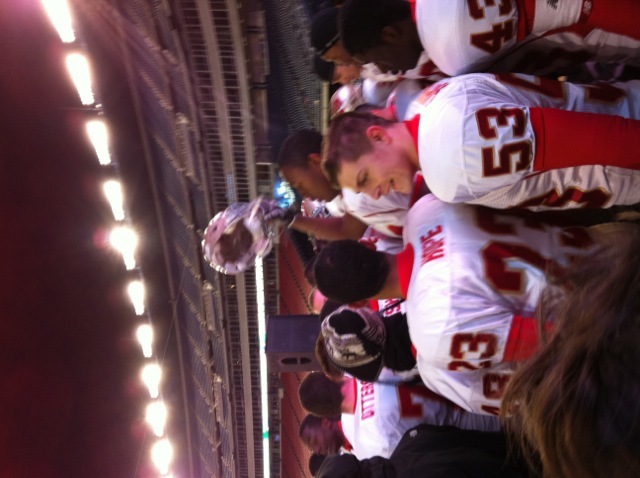 My answer … the Massachusetts high school football Super Bowls. This was a special day for many parents, teachers, staff members, principals, friends and family because it is a moment that will be cherished and remembered for years and years. Just think about the history of this exact day in five, 10, 20 or 35 years to these young men. They will always remember their particular game, no matter what the scoreboard read once the final whistle was blown, but the fact that they had the opportunity to be apart of a special and fun morning, afternoon and evening. Although, what will be remembered most from this day? Was it that a specific team lost or won a certain piece of hardware? Does it have anything to do with Gillette Stadium? You know I want to say Gillette Stadium, but I can’t forget about those four schools that participated in the Division IV and IV-A Super Bowls at Curry College on Saturday too. They deserve the same amount of love and recognition as the Division I, II and III schools. Yet, this particular day is not all about winning trophies or being crowned division champions, but instead, celebrating hard work, teamwork, overcoming challenges and of course, playing football for pride, not dollar bills. One athlete, who happened to be a member of the Everett High School football team, Jonathan DiBiaso, was thrilled to say how much he enjoyed his team’s victory on Saturday because it was due to teamwork rather than certain individual efforts. “I am extremely proud of them, it was a team (effort), hundred percent. No individual stars (throughout the game). It’s just overall a great team effort,” said DiBiaso. Sure, “effort” maybe the word, according to DiBiaso, but that is what a team does, they put in extra effort to go the distance and make it to a special day like this one. Even the head coach of St. John’s Preparatory in Danvers, had more to say about his team’s performance than his coaching abilities. “I have a great group of kids (and) I’m going to miss going to practice on Monday with these kids,” said head coach Jim O’Leary. The Northeast head coach of the Division IV-A champions, Don Heres, alluded to how this win was not too important to him, but his young men that he calls his football team. “It’s all about them. It’s all about them. I love it, but it is more about them, not (about) me,” said Heres. High school sports have and will always be about the friendships, teamwork and extra efforts that young men and women put in on a daily basis. Sure, playing on a stage such as Gillette Stadium is great, but what it all comes down to is the fact that this special day is remembered for years and years by these players, coaches, families, friends, school administrators and of course, spectators. If you have ever had the chance to take in a few hours of a high school sports event or even had the chance to attend this particular day at Gillette Stadium, then you may know how much excitement and energy is in the air, not just in the press box. Yet, these are special moments, memories and days that will always be remembered and certainly, I will remember 10 years from now how special this day was to not myself, but for the coaches and players who demonstrated that high school athletics is not about championships, rings or medals, but playing for the love of the game.